I was born in London on 11th June, 1970. Currently I hold an honorary research position at Exeter University's College of Engineering, Mathematics and Physical Sciences as well as teaching part-time at the University of Kent at Canterbury's School of Mathematics. Immediately thereafter, I took a one-year Royal Society European exchange fellowship at Ghent University in Belgium. At the conclusion of this, I had published a few minor papers, but had also gradually become disillusioned with academia (particularly with what I saw as the over-specialisation of modern scientific research). Consequently, I left mathematics to pursue other interests. 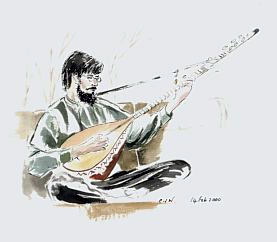 The following five years were spent travelling, playing a seven-stringed Turkish instrument (the saz), composing, performing and recording music in various contexts, planting trees, investigating a bizarre theory of time and consciousness, setting up an online parapsychology research project, considering possible relationships between Clifford algebras and the ancient Chinese I Ching oracle, and writing a little reference book, among other things. In the Autumn of 1995, whilst staying in the Spanish walled city of Avila, I suddenly became fascinated by (what little I knew about) the distribution of prime numbers. As my earlier mathematical research had not involved number theory, I had much to learn. However, I became convinced by an overwhelming intuition that there was some fundamental link between (i) the distribution of primes and (ii) the ubiquitous Gaussian (probability) distribution. I sought to learn more, in order to investigate this possibility. Had I been more thorough in my study of the matter, I would have noticed that P. Erdös and M. Kac discovered such a link back in 1940! However, there is some consolation in the fact that the result in question is far from transparent. In fact the deep reasons for this result seem to have mystified even the great Erdös – Carl Pomerance (Erdös number = 1) has suggested that he might (referring to Einstein's famous proclamation) have said something like this: "God may not play dice with the Universe, but there's something strange going on with the prime numbers!" In the winter of 1998, having been occasionally contemplating the mystery of the prime distribution for a while, I was struck by an even more overwhelming intuition about its ultimate nature. My wish to get to the truth of this matter led me back into serious mathematical study, and ultimately to the creation of the number theory and physics archive website. In more recent years, I wrote a trilogy of popularly accessibly books dealing with the more intriguing issues raised by this material. The first volume, Secrets of Creation vol. 1: The Mystery of the Prime Numbers was self-published in June 2010, receiving praise from Sir Roger Penrose and nobel physics laureate Brian Josephson, as well as popular maths authors Ian Stewart, Alex Bellos and Clifford Pickover. The trilogy was completed in early 2013 and was republished in spring 2015 by Liberalis Books. Most recently I've written an unusually formatted history book, You Are Here: The biography of a moment, an accelerating history of the City of Canterbury from the Big Bang to noon on the 15th August 2014. The timescales are based on the intersections of a timeline with a logarithmic spiral (centred at that arbitrarily chosen moment) and run from billions of years down to fractions of a second, the narrative running through cosmology, geology, natural history, human prehistory and history, ancient and modern, in ever-increasing detail, culminating in neuroscience and quantum mechanics. John McMurtry, "Rationality and Scientific Method: Paradigm Shift in an Age of Collapse"
D. Radin, "Time-reversed human experience: Experimental evidence and implications"
The Great Conjunction - a mysterious pamphlet jointly authored by the elusive London Psychogeographical Association and the Archaeogeodetic Association, published by Unpopular Books in 1992.